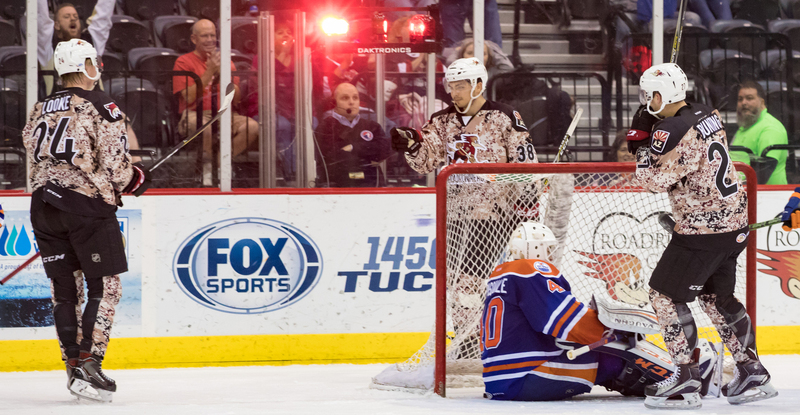 Continuing their surge as the American Hockey League’s hottest team, the Roadrunners swept the Bakersfield Condors in a weekend set at Tucson Arena, beating their division foe 6-3 Friday night, and 4-1 on Saturday. 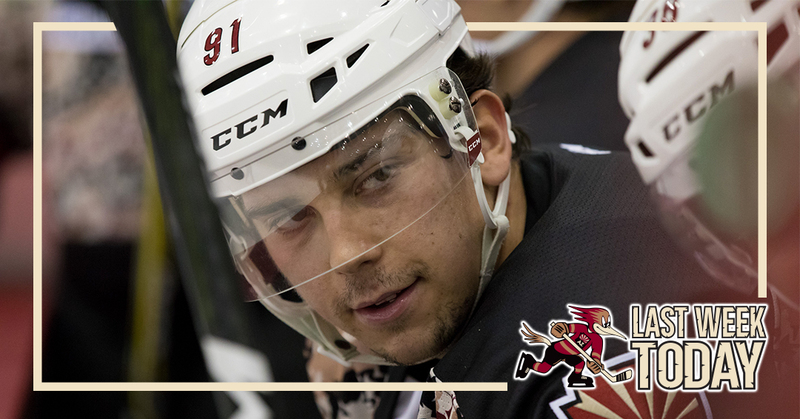 The team’s first line trio of Nick Merkley (2G, 2A), Dylan Strome (2G, 3A), and Lawson Crouse (2G, 1A) combined for 12 points in the two wins. Now with 15 points (3G, 12A) on the season, Strome leads all rookies in the league in scoring. Merkley’s 13 points (8G, 5A) is good for third in that department. Hunter Miska leads all rookie goaltenders in wins this season with five. He is 5-0-0 with a 3.09 GAA and a .894 SV% in six starts. The Roadrunners have allowed the least amount of goals (26) of any other team in the league, and are second in GAA, allowing their opponents an average of just 2.36 goals per game. A marvelous record of 5-0-1-0 was posted during their six-game home stand. The team has not lost a game in regulation since opening night, earning points in 10 consecutive contests (8-0-2-0). They have sole possession of first-place in the entire American Hockey League with an overall record of 8-1-2-0 and a .818 win percentage. Christian Fischer scored the Coyotes’ second goal in the club’s 3-2 overtime loss to the Washington Capitals on Monday night at Capital One Arena, redirecting a Christian Dvorak feed past Braden Holtby. Brendan Perlini netted both of the Coyotes' goals in the club’s 3-2 shootout loss to the St. Louis Blues Thursday night at Scottrade Center. Fischer and Perlini are tied for second on the Coyotes in goals scored with four apiece, behind Clayton Keller’s 11. Dakota Mermis played in all four of the Coyotes’ games during the week, registering a total of four shots on goal, a minus-1 rating, and a time-on-ice high of 13:55 minutes Tuesday night in Pittsburgh. 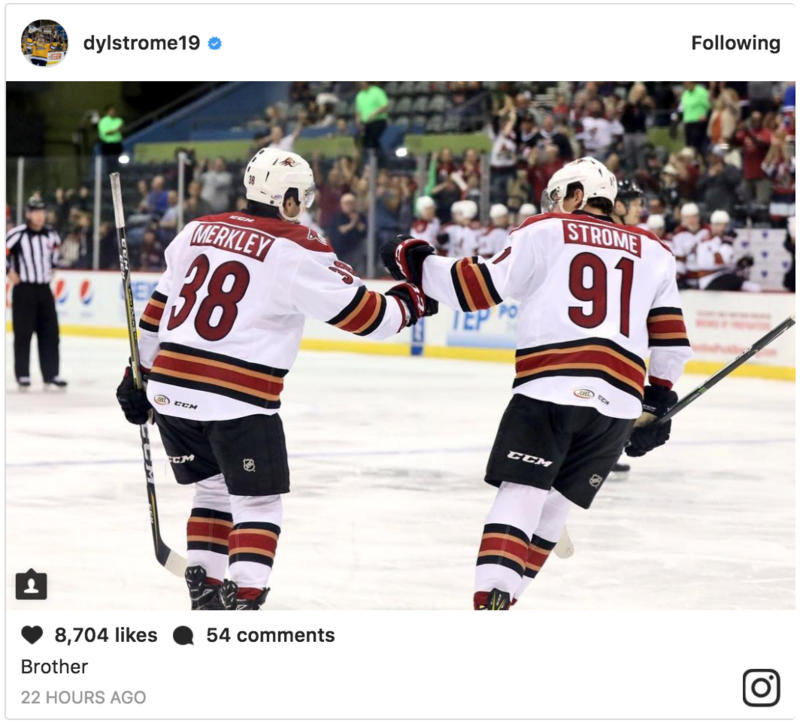 Andrew Campbell walks into a Dylan Strome pass and beats Bakersfield’s Nick Ellis with a wrist-shot to the far side to give the Roadrunners a 4-2 lead Friday night. Campbell’s goal, his first in a Roadrunners uniform, was also the third of the shorthanded variety for the team this season, which ties the league lead. Nick Merkley points to credit Jens Looke with the assist moments after scoring his team-leading eighth goal of the season Saturday night. (Credit: Kate Dibildox).